Joyriders who stole a workman’s van have been witnessed speeding through a Londonderry estate before trying to ram it into the local shop. 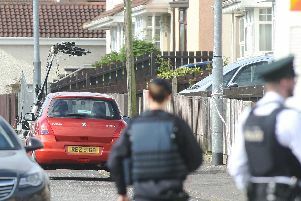 Residents and local councillors for the Galliagh area have expressed anger and frustration at the latest in a series of incidents on the estate last night. This is the latest in a series of incidents of joyriding through the area by youths, who have also targeted the Spar shop, which is known locally as ‘the Co-op’. Sinn Fein councillor Sandra Duffy said a robust response is needed to deal with car criminals 'who are causing havoc in Galliagh and putting local lives in danger'. “Once again we had car criminals on the streets of Galliagh causing havoc, putting resident’s lives in danger and leaving a local person without their works vehicle," councillor Duffy said. “The stolen vehicle was driven recklessly around Galliagh before crashing into the front of the Co-op. “These car criminals have absolutely no regard for the people of this area. “What is needed is a robust response and what I mean by that is those responsible for striking fear into the community need taken off our streets and brought before the courts. SDLP Councillor Brian Tierney meanwhile said: “The actions of those who decided it was a good idea to steal a local man’s work van drive it around the Galliagh area, in a crazy manner and crash it into the Co-op is totally and utterly unbelievable. “These actions affect the entire community, which these people seem to have no respect for.